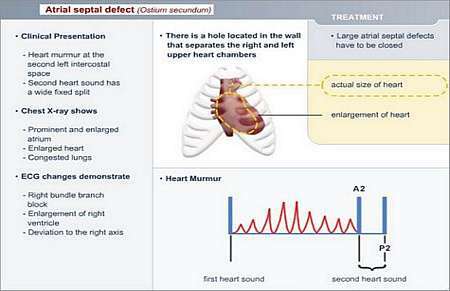 An atrial septal defect is a hole (or defect) in the wall (septum; muscle wall separating the upper heart chambers) between the left atrium (upper heart chamber) and the right atrium (upper heart chamber). A portion of the blood from the left atrium flows through the hole to the right atrium. This increases the amount of blood flowing to the lungs. 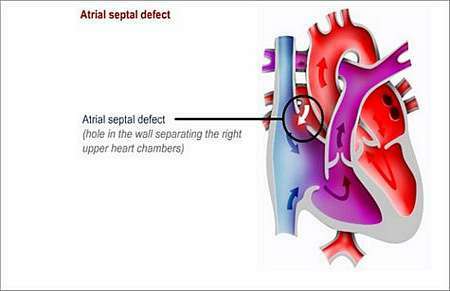 An atrial septal defect may also be known as one of the conditions associated with the term "a hole in the heart". Various forms of ASD exist, but only the most common type, known as the secundum ASD, will be discussed. Before birth, the foetal heart has a hole (called the foramen ovale) between the left and right atria (upper heart chambers). This hole usually closes soon after birth. In certain newborn babies, it may not close completely and a hole or partial hole remains, which is called an ostium secundum defect (this is the most common type of ASD). There are other types of holes that may be found in different parts of the atrial septum, which are called an ostium primum defect and a sinus venosus defect. 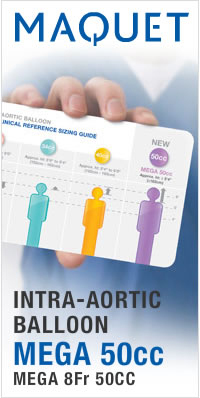 Therefore, some babies are born with a hole in the atrial septum as a result of a birth defect. Because the filling pressure is higher on the left side of the heart, with a thicker pump chamber, blood leaks through the hole from the left side into the right atrium. This results in that the right-sided chambers are expected to handle an additional volume load. The magnitude of this extra volume is called a shunt fraction and is usually expressed as a relationship (fraction) between right heart and left heart volumes that are handled per minute. If the leak is minor, there may only be minor problems, but if the hole is large and there is a lot of leaking, the right atrium, right ventricle and pulmonary artery will become enlarged. Because of the higher than normal flows through the lungs, these children might develop pulmonary hypertension. Children who have major septal defects usually have problems with breathing and fail to thrive. Even though the ASD is present from birth, the defect does not usually cause symptoms during childhood and the condition may only be diagnosed during a routine medical check-up. The symptoms occur because the increased amount of blood-flow through the heart and lungs gradually cause pulmonary hypertension with damage to the right heart muscle over time. Adult patients eventually present with arrhythmias (irregular heart rhythm) and heart failure (the heart is not able to pump sufficient blood to meet the bodys requirements). Blood and fluid build up in areas of the body such as the lungs, liver, lower legs and abdomen. 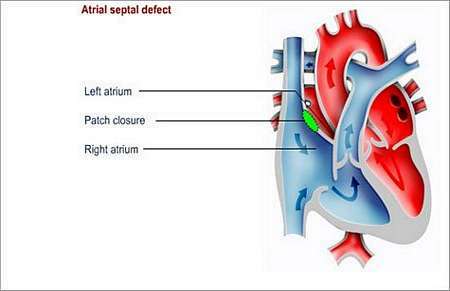 Some atrial septal defects close by themselves before the child is two years old. After this, natural closure is rare. A device that looks like a two-sided shell or button (occlusion devices) is guided through a vein that is accessed in the groin. The occlusion device is placed in the defect to close the hole. Surgery is usually recommended in serious cases (when the right side of the heart is enlarged). It is also used in cases where the defect is not suitable for catheterisation-based treatment. During surgery, the hole is covered with a patch. The operation is preferably done before the child starts school, as it is better to close the hole before the heart muscle becomes too enlarged and stretched. Once the hole has been closed, the heart will gradually return to normal size. A heart-lung machine is used during the operation. The operation leaves a scar either in the middle of the chest or under the arm. The child will have to be followed up in outpatients for a year after the corrective surgery has been done. This is a curative procedure. It is important to prevent endocarditis for a year after the defect has been closed. Endocarditis is an infection of the lining of the heart or heart valves.